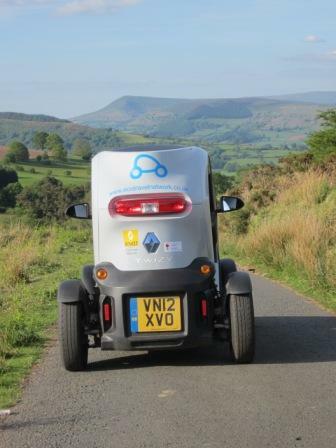 We own a Renault Twizy and operate a small hire fleet of them via the Eco Travel Network here in the Brecon Beacons. Apart from being great fun to drive and a fabulous way to enjoy the hills and lanes of rural Wales, our main interest in the Twizy is its minimalism. Our Twizy has no doors or windows, carries 2 people in minimal comfort and has a top speed of 50mph and a range of 50 miles. We use it for all our local travel and have done 6000 miles in 14 months. This directly challenges our modern Western assumptions about cars as vehicles which carry 4 or 5 people in air-conditioned comfort at 70 mph for 400 miles on one tank of fuel. We expect this even though most of our everyday car journeys are less than 5 miles at an average speed of less than 30mph and last less than 10 minutes! But this extra comfort and performance wouldn’t matter if it didn’t come at a price – energy. And unfortunately, most of the energy in modern cars is required to move the vehicle rather than whoever is being transported by it! This is still the case when the car is electric although the relative efficiency of short journeys is much improved. The Twizy is important because it explores the opposite end of the scale. When doing a short local journey, what do you actually need? How much speed? How much range? How much comfort? – windows? doors? On a journey of less than 5 miles, for example, a top speed of 50mph versus 70 mph makes negligible difference to the journey time. And you tend keep your warm coat or waterproof on if you are only going to be in the vehicle for a few minutes and the weather outside is foul. The result of a more minimalistic vehicle is that our Twizy uses ~100 Wh/mile – roughly half that of most “ordinary” electric cars and less Wh per passenger mile than a full bus. At such a low consumption level, charging the Twizy from local domestic sources of renewable electricity is realistic and charging from an ordinary 13amp household socket is straightforward. Indeed, Powys (where we live) could power all its local transport from its own renewable energy sources (wind and hydro), if such travel was done in Twizy-like vehicles. Our household could own a Nissan Leaf or a Renault Zoe instead but then our PV panels would cover less of their charging requirements and certainly leave us exporting less solar electricity to the grid. Obviously, we welcome the advances in electric vehicles meaning that their performance and range edges ever nearer to mainstream cars. Our community electric Kangoo van, for example, is far superior and far more useful than our first community electric car. However, there isn’t enough renewable electricity for us all simply to switch from combustion engine to electric cars and continue to drive in the style we are used to. Something has to change. We have to find ways simply to use less energy moving around and so our outlook and behaviour to car travel needs to change. This is what makes the Twizy (hopefully as a first example of a new class of ultra low energy vehicle) particularly important. Whilst electric vehicle advocates enthuse about how close to ‘normal’ car performance electric car travel is becoming, the Twizy, in contrast, explores a new and different means of local travel which uses a lot less energy but does so in a way that’s funky and fun rather than hair shirt. Its psychology is perfect in that regard. And because behaviour drives attitude, the experience of driving such a vehicle (particularly in hilly country) makes one highly conscious of the energy required to move vehicles and bodies from a to b. Just as you resent any extra baggage you have to carry on a day out climbing a hill (because that energy difference directly affects you), you find yourself similarly resenting energy ‘lost’ on powering a heavier, higher range electric car up a local hill. If the world simply sees the Twizy as a cheap, dispensable early step to “proper” performance electric cars, we’ll have missed something important. This entry was posted in Psychology, Technology and tagged behaviour change, eco travel network, electric vehicles, energy, psychology, Twizy. Bookmark the permalink.